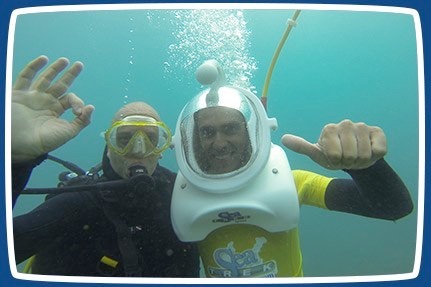 ¡Welcome to Sea Trek the best underwater experience! Imagine walking underwater surrounded by incredible marine life... zero-gravity, that's Sea Trek. Experience the excitement of exploring the ocean and all its wonders without devoting your valuable vacation time to make specialized training. IDEAL FOR THOSE OF EIGHT YEARS AND ABOVE, Sea Trek is the main system for helmet diving in the world, developed by Sub Sea Systems, a world leader in aquatic activities for tourism. If you can walk and breathe, you can do Sea Trek.